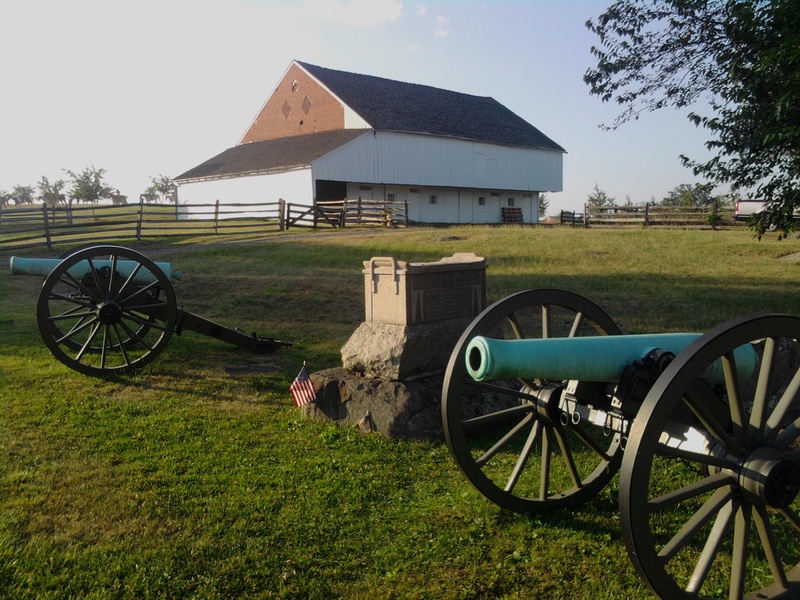 I’ll be giving a lecture later this week on the Battle of Gettysburg. A broad topic. To provide a bit of local interest, I thought I would focus on some of the actions of Massachusetts units and leaders. There were a total of 18 regiments of infantry, 1 regiment of cavalry, 4 batteries of light artillery and 2 companies of sharpshooters from Massachusetts present at Gettysburg. The contributions of the Bay Staters during the engagement are too numerous to fully describe here. But I thought I’d share just a few anecdotes relating to Massachusetts at Gettysburg. On the first day of the engagement, July 1, 1863, as the slow and unplanned collision of the two armies began, the 12th Massachusetts (part of Baxter’s brigade) was among the first of the I Corps units to occupy Oak Ridge and stall the Confederate advance northwest of town. There they took part in one of the more astounding and terrible episodes of the battle. Lying down behind a stone wall, Baxter’s brigade (including the 12th Mass) watched in amazement as Iverson’s brigade of North Carolinians advanced on their position…no skirmishers out, apparently oblivious to the danger in front of them. When the 12th Mass and the rest of their brigade opened fire, hundreds of Confederates were instantly cut down. 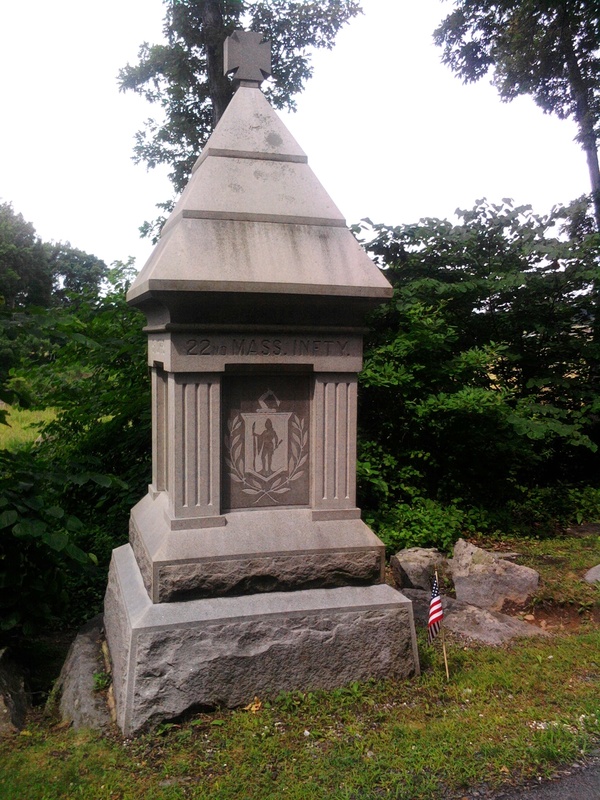 Iverson’s brigade suffered two-thirds casualties in a matter of minutes. Three Massachusetts regiments of infantry (the 1st, the 11th and the 16th) belonged to the 1st Brigade (Carr’s), Second Division (Humphreys’s) of the III Corps. On the night of July 1, as units marched with all possible speed to join the battle, Humphrey’s division was given bad directions by a staff officer and ended up taking a wrong turn in the dark. The detour landed them near the Black Horse Tavern on the Hagerstown Road, smack within Rebel lines…about three miles from where the rest of the Union army was gathering. The regimental historian of the 1st Massachusetts wrote that the column stood in silence within a stone’s throw of thirty pieces of Rebel artillery as they tried to ascertain their whereabouts. The mistake was discovered when a Confederate artillery sergeant was taken captive and the column turned around and somehow managed to tiptoe away. They finally made it to Round Top at about 2 a.m on July 2. The 1st Massachusetts would, in the afternoon of July 2, find itself in the maelstrom of fighting on the right of the III Corps’ line along the Emmitsburg Road, north of the Peach Orchard. As the regiment struggled to fend off repeated charges, Lieutenant James Doherty, commanding a company of the 1st Mass, sensed his men were on the verge of panic and ordered them to shoulder arms. He then, in the midst of a perfect hell of fire, put them through the manual of arms as if on the parade ground. The familiar ritual had the desired effect of calming his company and they fought on. The 11th Massachusetts was in the same brigade, also along the Emmitsburg Road. As the Confederates bore down on them, the 11th Mass was given the mystifying order to hold their fire…a miscommunication on the part of one of aides of Gen. Carr who commanded the brigade. Eventually, with the Confederates at close range, Lt. Col. Porter Tripp, commanding the 11th, ordered his men to open fire, ignoring what he believed to be a direct order. Confusion continued during the heavy combat. Caught in a crossfire, the 11th Massachusetts changed its front to rear, wheeling to the right. Lt. Henry Blake of the 11th wrote that the complicated order must have been given by “some stupid general,” but he was not aware that their brigade had been flanked on both sides. The 11th Mass retreated with the rest of the III Corps. By the time they made it back to Cemetery Ridge, they had lost eight color bearers and suffered roughly 50% casualties. About the same time, the 22nd Massachusetts of Gen. James Barnes’s division, V Corps, was moving into position on the Stony Hill northwest of Little Round Top on the Rose Farm. The men hunkered down among the rocks and trees and began to pile cartridges and percussion caps on the ground in front of them, sensing that they would be holding this ridge for some time. But it wasn’t to be. When the III Corps retreated, the oncoming wave of Confederates struck Barnes’s division so suddenly that Barnes was unnerved and ordered his division to retreat without any permission to do so. The men of the 22nd Mass begrudgingly picked up their ammunition and withdrew back across the Wheatfield, fighting as they went and suffering heavy casualties. Secondary monument to the 9th Mass marks where they were surrounded on the Trostle Farm. Their primary monument is further forward on the Wheatfield Road. Wreckage of the 9th Mass Battery at the Trostle Farm shortly after the fight. As Federals of the III and V Corps retreated from the Emmitsburg Road, the Peach Orchard, and the Wheatfield, the Confederate tide began to sweep towards Cemetery Ridge. A line of gun batteries near the Wheatfield, which had been behind the infantry line, was now exposed to the assault and completely without support. Among them was the 9th Massachusetts Battery commanded by Capt. John Bigelow. This was their first fight. As the other batteries pulled back, the 9th was the last on that part of the field. Their brigade commander, Lt. Col. Freeman McGilvery, rode up to Capt. Bigelow and informed him that they were “alone on the field, without support of any kind…Limber up and get out!” But there wasn’t time to withdraw using horse teams. The 21st Mississippi was almost on top of them. So the 9th Mass Battery retired by prolong, pulling the guns to the rear even while loading and firing, using the recoil of the cannons to help propel them backwards, blasting cannister into the 21st Mississippi at vicious range. 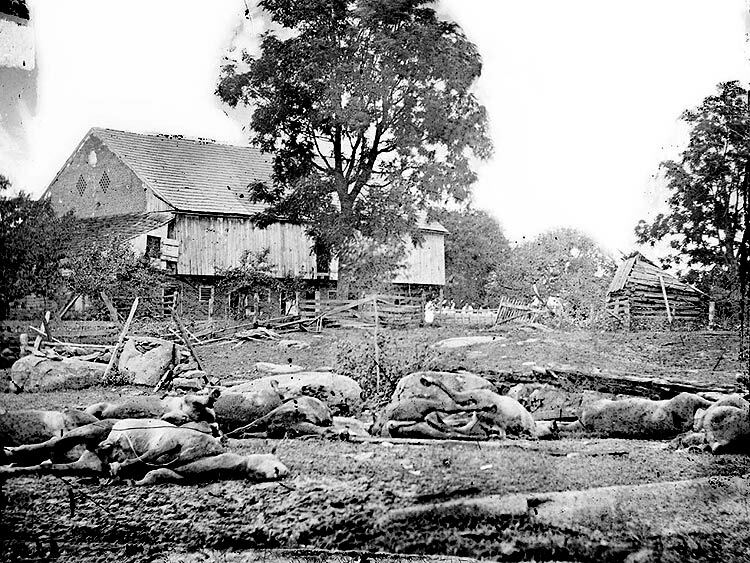 Battery made a stand against the Barksdale’s Confederates that bought Union commanders half an hour…enough time to bring up elements of the II Corps. By that time, the 9th was flanked on both sides, lost four of their guns, but eventually managed to withdraw. These are just a few sketches of Massachusetts units at Gettysburg. There are many more regiments to mention in future posts.